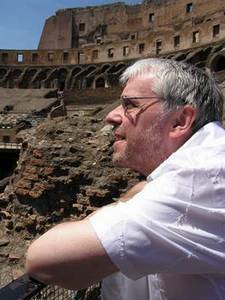 A history of the Roman Colosseum. A brief history of the Roman Colosseum and its place in Italian culture : all the facts and figures you could possibly need in one convenient location. 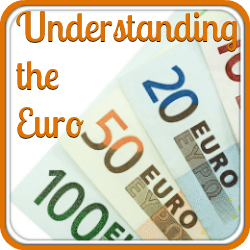 What makes our information different? There's a huge amount of information about the Colosseum of Rome. 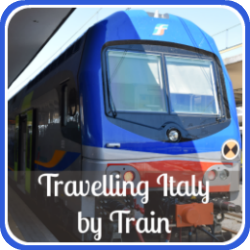 You'll find facts and figures about it all over the internet and in every guide book about Italy. Most importantly, because we live in Italy and we've visited the Colosseum many times - so we know what to tell you to look out for! We also have linked pages to more out-of-the-ordinary facts. A modern reconstruction of the Colosseum, based on known facts. Courtesy of the V-Roma project. This is what our first page of facts about the history of the Roman Colosseum covers. Scroll down the page, or click on any of these to go straight to that section. Where, when and by whom was it built? Why is it called the Colosseum? The history of the Roman Colosseum : where was it built, when and by whom? 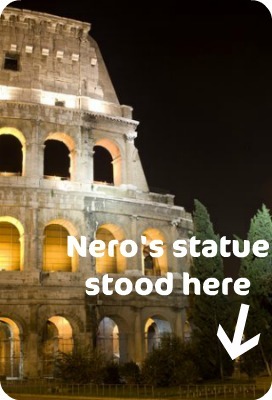 It stands in the city of Rome, Italy, on the site of what used to be a huge artificial lake built by the Emperor Nero as part of his Imperial Palace. Nero was a highly unpopular Emperor. After his death the lake and palace were dismantled by his successor, the Emperor Vespasian, with the blessing of the people of Rome. 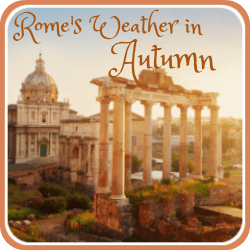 Building was started in the year 72 A.D. and finished eight years later in 80 A.D., in the reign of Vespasian's son, Emperor Titus. Are you planning to visit but don't know your way around the city? 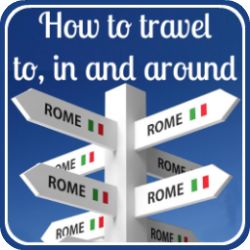 On this page you'll find a map showing the location of the Colosseum of Rome as well as our top tips for visiting. Where does its name fit with the history of the Roman Colosseum? Its original name was the 'Amphiteatrum Flavium'. How did it become the Colosseum? If you're due to visit Rome, look out for the shrub bed adjacent to the main road which runs down the side of the Forum and ends just outside the Colosseum. It's where a gold and bronze statue, 32 metres (105 feet) high of the Emperor Nero stood, at the gateway to his home. It was dismantled by Vespasian and a group of large shrubs now stand in its place. It was called the 'Colossus' and it's thought that the Colosseum gets its name from that statue. History of the Roman Colosseum - how big was it? Even today it is absolutely massive - but only about one third of the original building remains. Seeing it for the first time everyone feels quite overwhelmed by its size, both inside and out. If you want exact dimensions, it was 50 metres (164 feet) high and measures 157 metres (515 feet) around its base. There's only a small part of the original height left. A standard sized house is around 2.5 metres (eight feet) per storey - plus roof space - which would make the Roman Colosseum the height of a twenty-two storey house. During the Middle Ages, a lot of the lead and iron holding the building together was removed and sold, so part of the building simply crumbled. You can still see holes in the walls where it used to be. Taken on the first level. Top tier seats were steep and distant! It seated around fifty thousand spectators on four levels. Standing room at the top was added later. The closer you sat to the Arena itself, the more important a person you were in ancient Roman society. If you visit the Colosseum it's immediately clear that those at the top were the lowest section of society - the top tier seats were incredibly steep and far removed from the main arena. It's known that spectators in those seats had less legroom than a passenger in a modern-day economy plane. When you visit, look up. In the top brickwork you'll see holes. These were used to place huge wooden arms which in turn held massive fabric awnings. To protect spectators from the sun, men were tasked with pulling the awning right over the top of the Arena, leaving a small hole for light in the middle. What does the history of the Roman Colosseum tell us about building techniques? Ancient Roman culture relied on slave labour for its architectural achievements, including the Colosseum. Even so, it was built so quickly that researchers think it's likely to have been divided into sections and each section given to a different building contractor to complete. View from the top - seats here were a long way from the action! Photo courtesy of www.v-roma.com. How do they know? Although the formal history of the Roman Colosseum shows there were detailed drawings and probably scale models to inform the building work, there's evidence of different methods and quality. Even in ancient times, some builders cut corners! The Romans had a vast selection of machines equipped with pulleys and hoists which, although made of wood, were able to raise enormous weights. If you visit, notice the holes in almost all the blocks - these would be used to hook the stones onto the machinery for lifting. The blocks were held together with molten metal, probably because the Romans had seen other large buildings collapse in a country renowned for earthquakes. Most of the metal was removed for profit in the Middle Ages. All the materials used were available reasonably locally. Limestone was imported from Tivoli, about twenty miles away and was used for pillars and external walls. Local limestone gives the Colosseum a warm golden glow. If you've ever seen the Colosseum lit by the sun, or artificially lit at night, it's this stone which gives the building its beautiful golden glow. 'Tofus' is a popular porous stone used even today in Italy ('tufo') and provided most of the internal structure. An early version of cement secured the load-bearing archways and quick-setting mortar bound it all together. And finally, about one hundred thousand cubic metres of marble was used to adorn the outside and the seats of the most important spectators. What's the place of the history of the Roman Colosseum in Italian culture? This was basically the place for Romans to be entertained, but it was importantly also to display the greatness of their Empire. 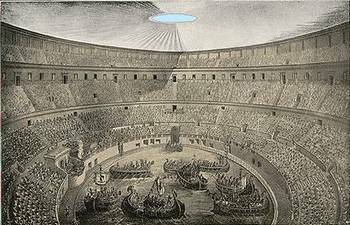 For a ruler, the bigger his Arena the more important he was considered in the cultural life of the Empire. Rome was the hub of the Empire, and its Colosseum was the largest. No-one could mistake the importance of the Emperor. The bigger the games he laid on there, the more popular he became with the people. In a culture where killing Emperors was considered almost an acceptable sport, this was a critical part of an Emperor's efforts to keep himself alive. 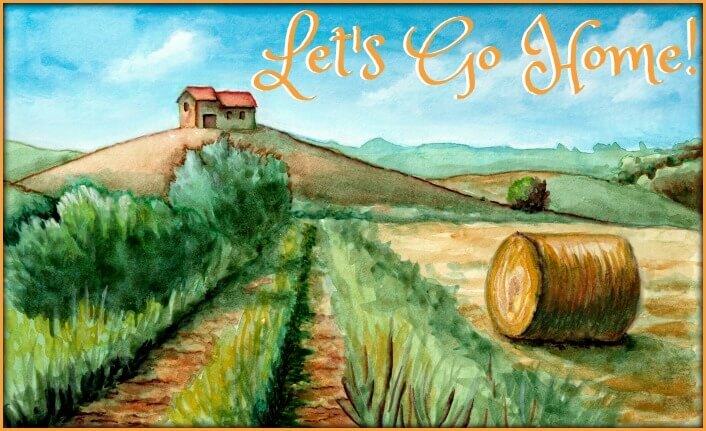 In our experience, Italian people always like a good party : so the games didn't take place on just one day. They would normally be spread over several days and at the opening extravaganza they lasted for a full one hundred days. Image of a naval battle in the Colosseum. Notice the awning stretched across the top. It's thought that the history of the Roman Colosseum included sea-battles. There is evidence of a drainage system which could have been used to flood the main arena itself so that the most successful battles of the Roman Empire could be re-enacted for the people. Why? Because it emphasised to the masses how great the Empire was and how great the battles they won. Importantly in terms of popularity, the Emperor used the riches he gathered whilst conquering different countries to fund the games, so entry for spectators was free. So the Colosseum quickly became a way for the Roman Empire to prove to those cultures it had not yet conquered that it was a powerful and rich entity which could provide exotic and extravagant entertainment for its people. In today's culture it is, quite simply, an Italian icon and remains a symbol of the great Roman Empire. 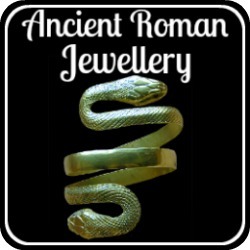 If you want to know how far that Empire extended, have a look at our map of ancient Rome. How many were killed ? The Colosseum and Italian culture now. 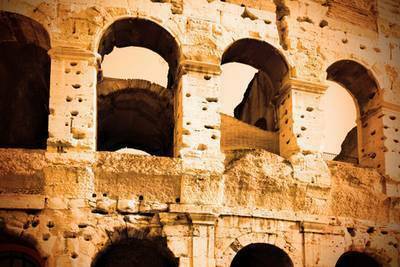 Want some rather strange facts about the history of the Roman Colosseum? Click on the pic and have a look at these pages. 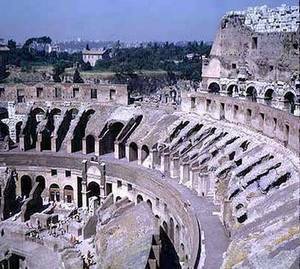 If you've enjoyed this page about the history of the Roman Colosseum you may also like these pages. 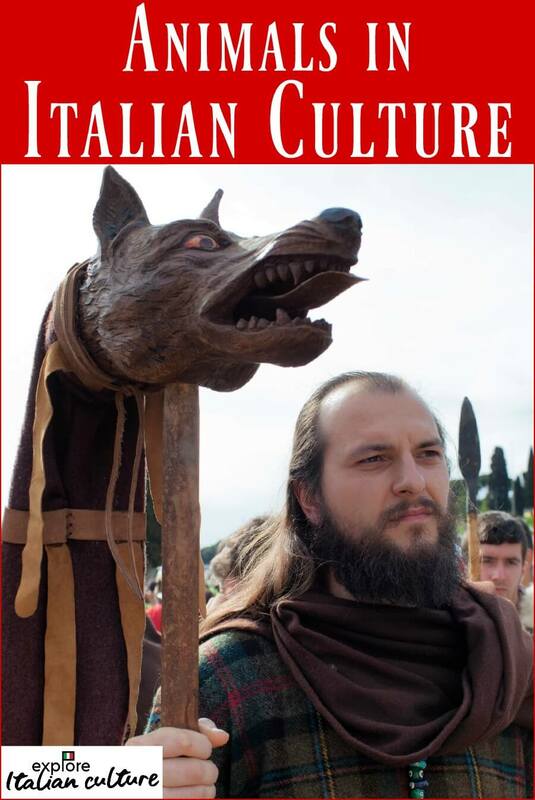 Want to know how animals were seen in ancient Italian culture? 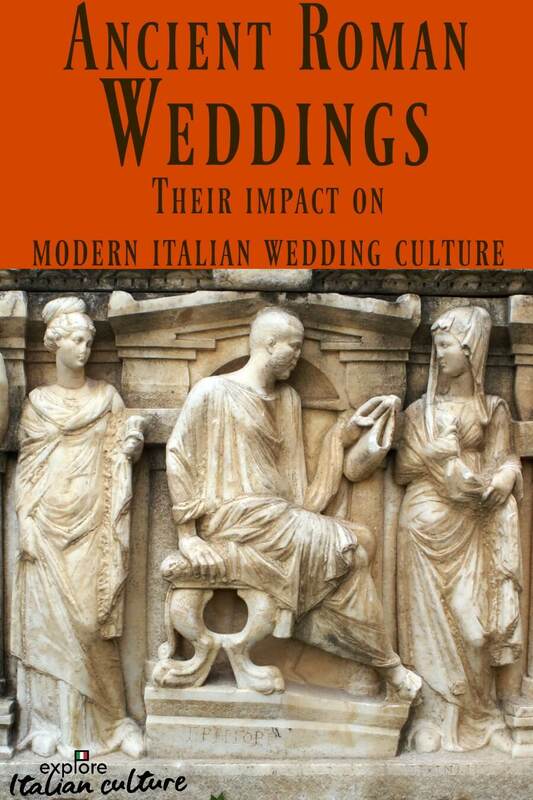 Interested in how the Empire's traditions influenced our own wedding customs? Or would you like to know what jewelry women would have worn to the Games? 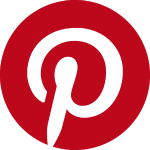 Click on the pics to see our detailed information pages.